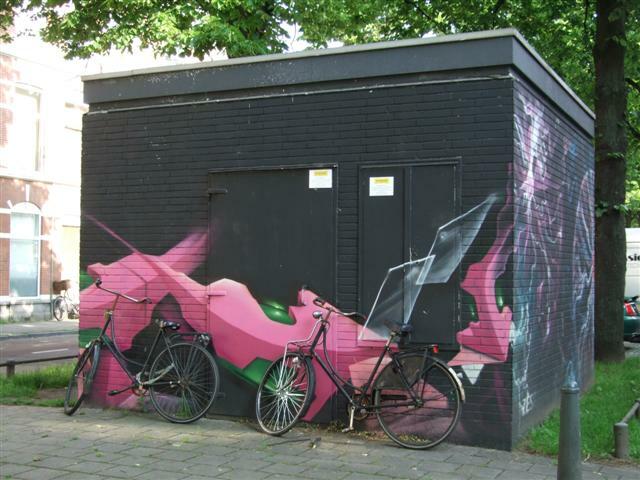 Way back in 2012 I featured this as one of my series of electrical substations: Just Humming Along in the City… (or Should That be Buzzing?) 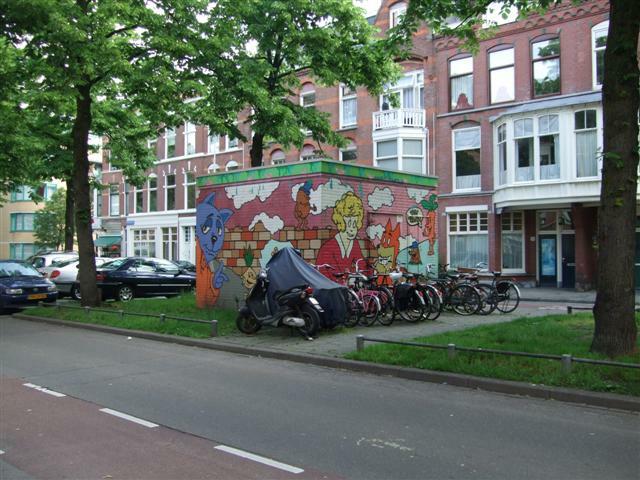 and recently Himself and I passed it again after having lunch in the Brownie and Downies café and saw it rather congested with bicycles. There had been cars around it too, but for some reason several all left more or less at once, so I snapped up a few photographs before more cars swooped in to take their place. My biggest question was how on earth did someone manage to stack one bike on another like this? I don’t get out so much , so even the small things can make me smile and make my day. 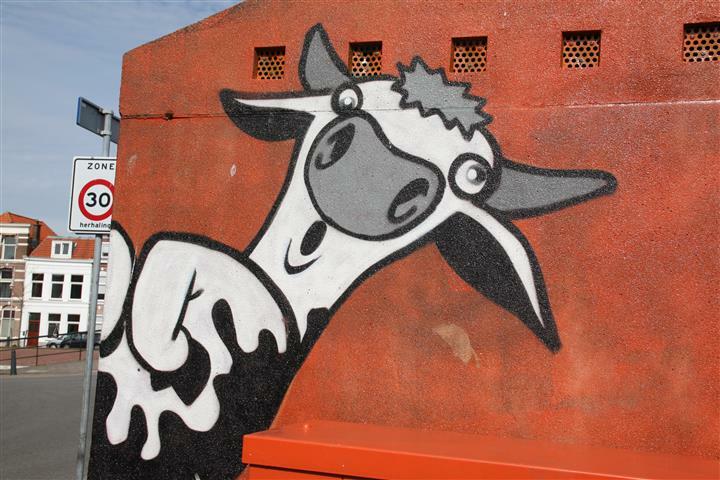 This quirky sight certainly did. 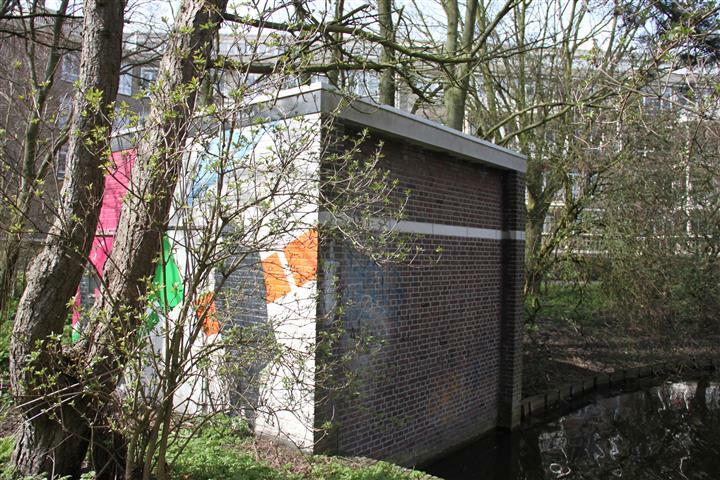 I thought that I had found and photographed all of The Hague’s colourfully decorated electrical substations, but every now and again when we are out and about driving to an appointment, Himself and I spot another one. 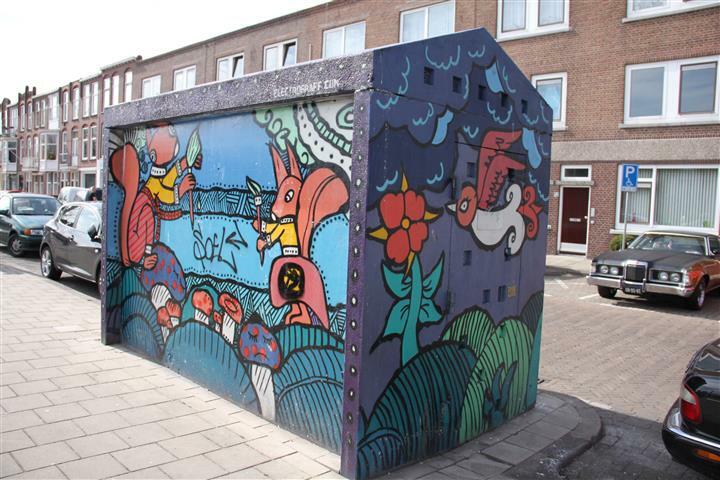 These are all part of an initiative taken by Geemente Den Haag ( The Hague City Council) to brighten up the city by turning what were originally sombre grey electrical substations into cubes of colourful creativity. 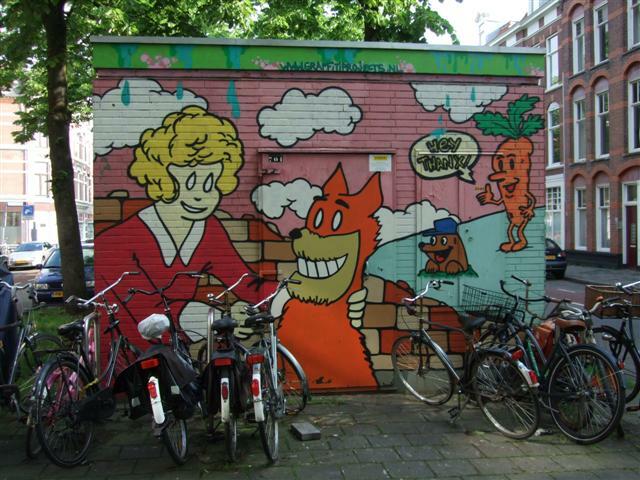 Different artists were called upon to do the work and their styles vary greatly, which I personally think is excellent, giving the locals of The Hague a taste of everything from photographic realism to cartoon whimsy or drama. 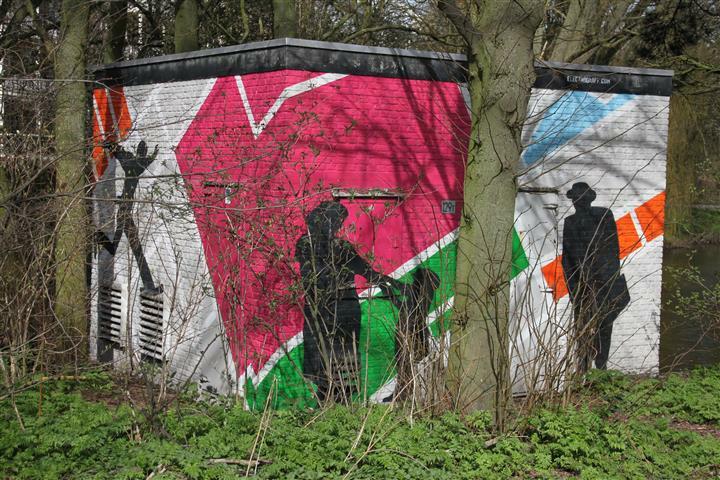 Whilst I’m delighted to have discovered several more examples recently to add to my photographic collection, the downside of finding them a good few years after they were commissioned is that some of them have deteriorated in quality and in some neighbourhoods a few of them have been vandalised by graffiti. 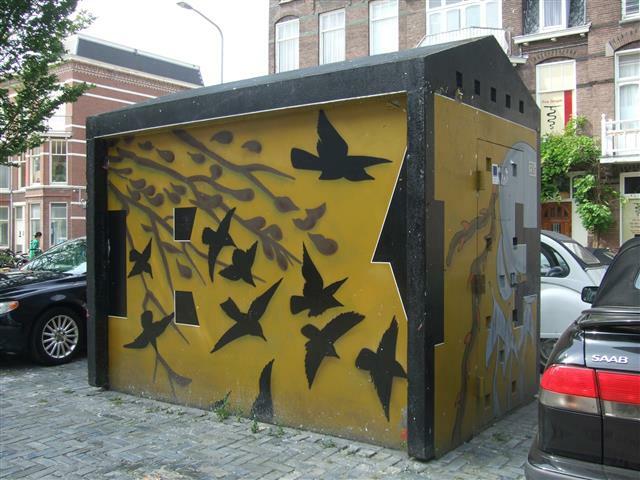 This electrical substation can be found on the Regentesselaan and has one of the more limited colour palettes of all the boxes: the original having a bird theme in black, yellow and grey. 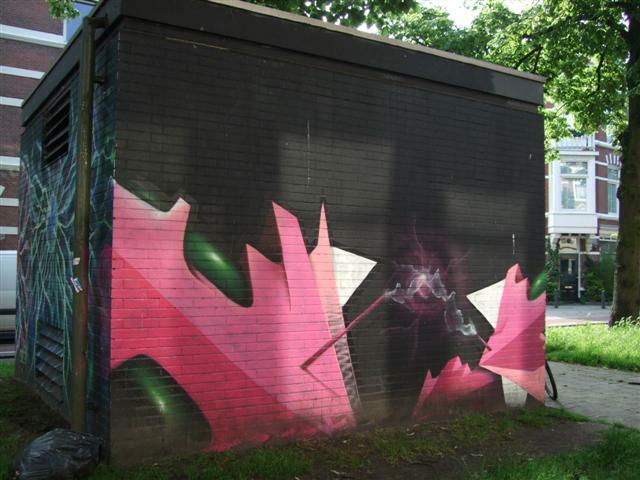 I find this a great shame, surely one person with a can of spray paint should show a little more respect to another spray paint artist? 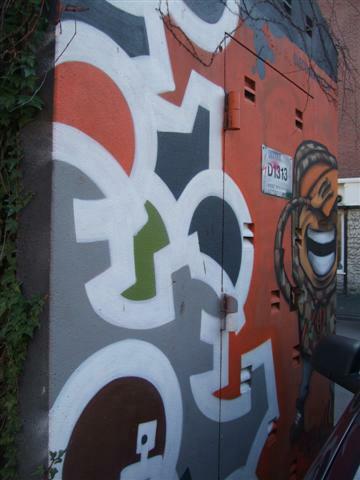 Birds of a feather may well flock together, but in the case of spray paint artists, apparently they don’t. 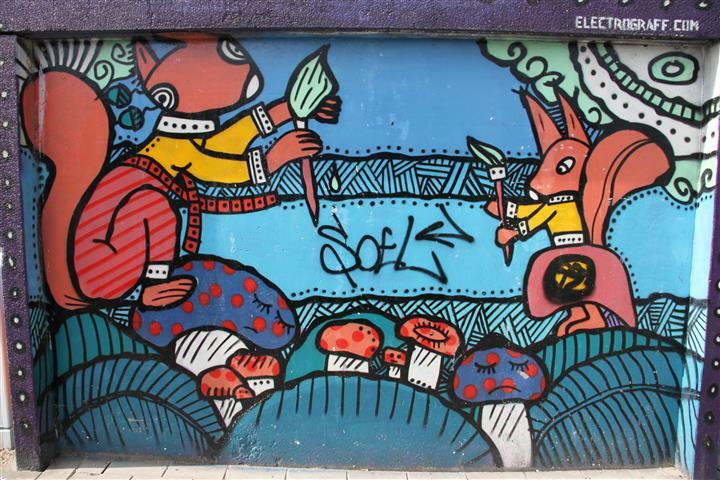 If you live in a city and travel around with an eye out for art forms great and small then you are sure to eventually stumble upon something somewhere. 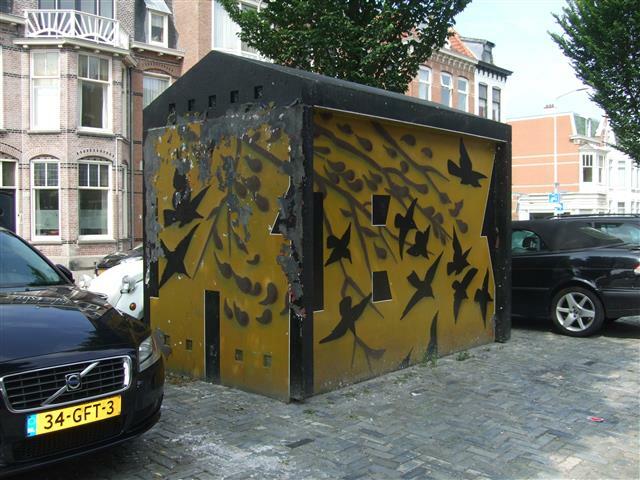 In European cities, with their centuries of inspiration and history it’s not too hard to find amazing architecture, but the practicalities of modern living can be harder to make artistic and engaging. 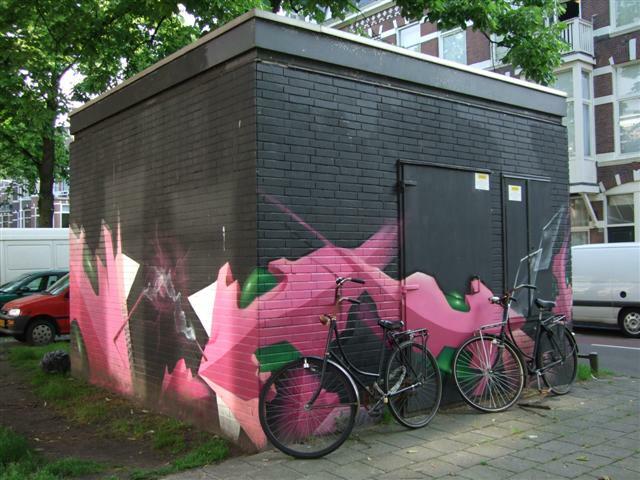 Modern buildings can often be described as “boxy” and when it comes to supplying modern daily needs with mundane things like electricity, the humble substation usually appears as a little cube of “battleship grey” all around our neighbourhoods. 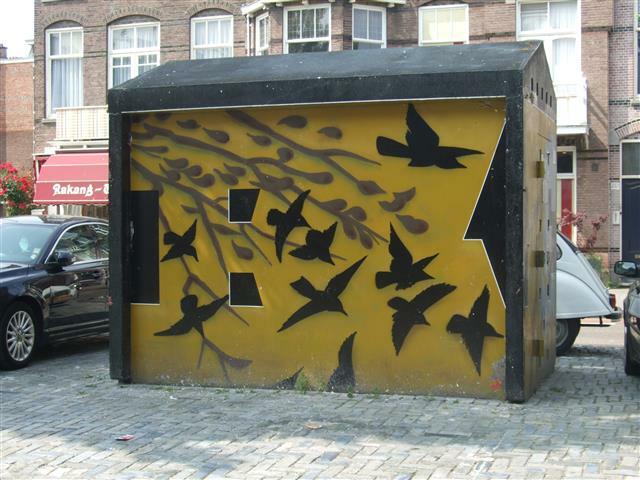 Fortunately Gemeente Den Haag (The Hague City Council) commissioned various artists to paint up Electricity substations around the Hague as part of a local beautification programme and I loved the improvement so tried to find and photograph as many of them as I possibly could. 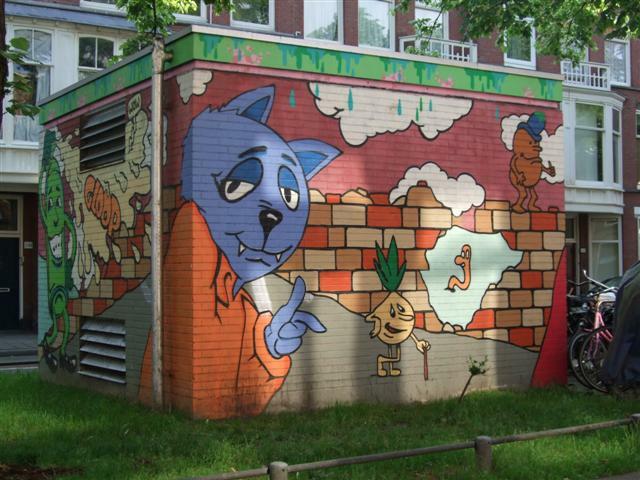 This one is situated at the intersection of Loosduinseweg and Fahrenheit and is close to a neighbourhood basketball court and children’s playground so that colourful quirky nature of the images are rather appropriate I think. 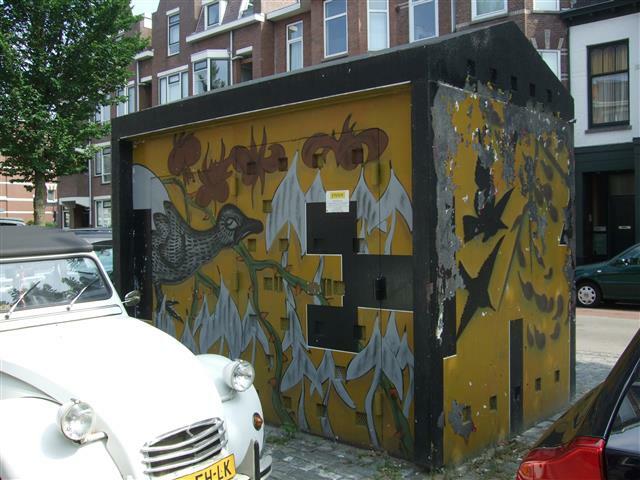 I love these substations, and I love discovering them: I don’t even think I have found them all. Here’s to many more happy discoveries. 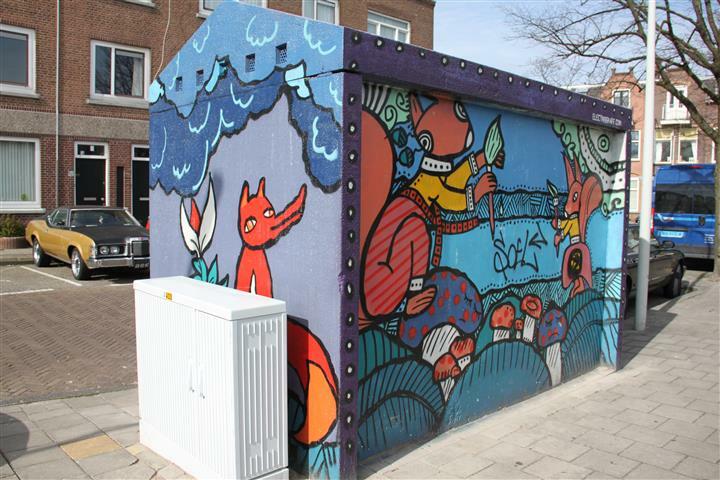 Gemeente Den Haag (The Hague City Council) commissioned various artists to paint up Electricity substations around the Hague as part of a local beautification programme and I loved the improvement so tried to find and photograph as many of them as I possibly could. 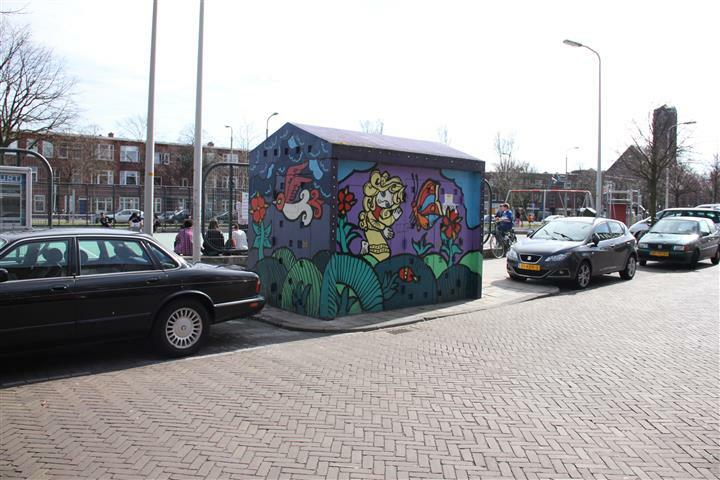 This one is situated at the intersection of Newtonstraat and Suezkade and not only livens up the area but also bought a smile to my face. 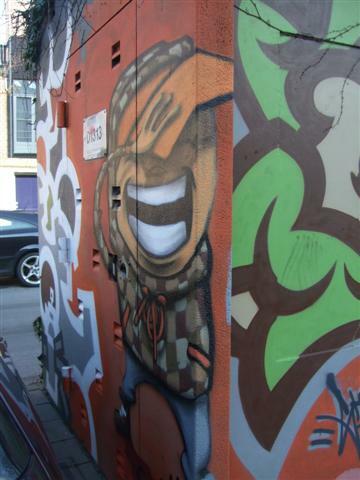 In fact this substation box is one of my top five favourites so I hope you enjoy these photos as much as I enjoyed visiting it and taking them. 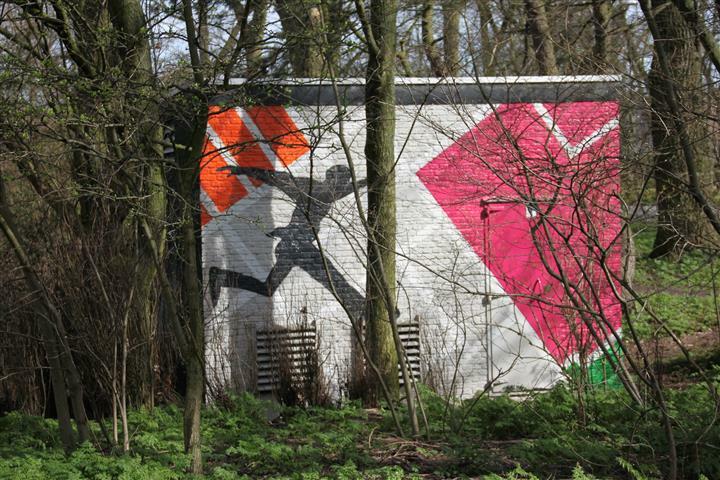 These used to be grey boring substations that have been decorated around the Den Haag (The Hague) by various artists commissioned by the Geemente (City Council) in recent years. 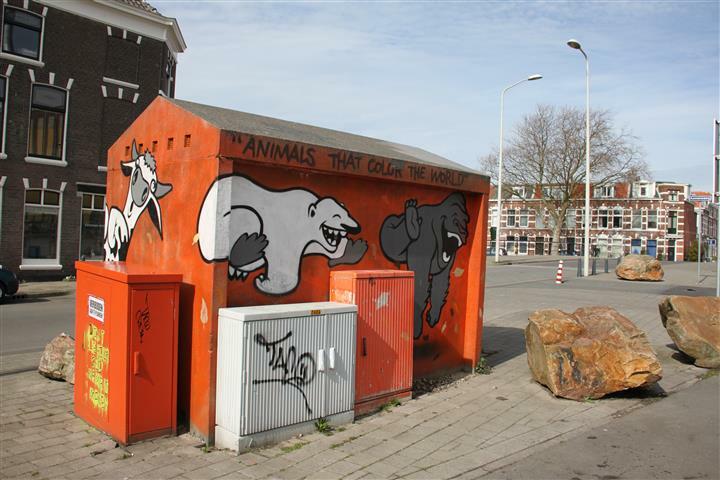 This one can be found near the intersection of the Goudsbloemlaan and the Segbroeklaan. 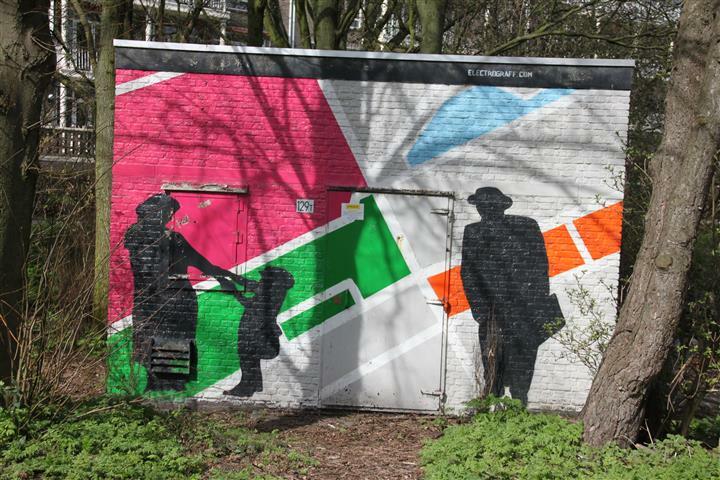 It has a white background with geometric shapes in solid colours and on the two decorated sides (the other two sides mostly face the canal behind) there are silhouette figures of a boy mid-leap, a woman and child in a playful stance and a man in a hat with a briefcase. Even with the limited detail that the silhouettes offer, I get the idea that the clothes are either 1930’s or 1940’s in style… do you think so too? 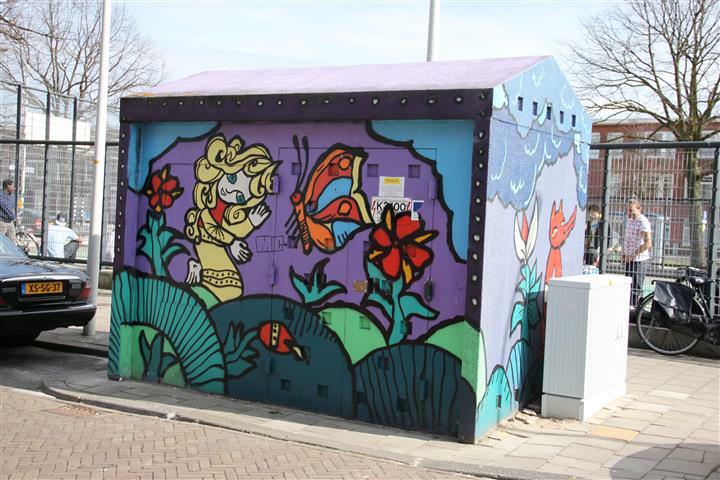 The daffodils have only just bloomed so an extra splash of colour is around nearby, but in the depths of winter it’s nice to notice an electricity box that livens up the local scene. 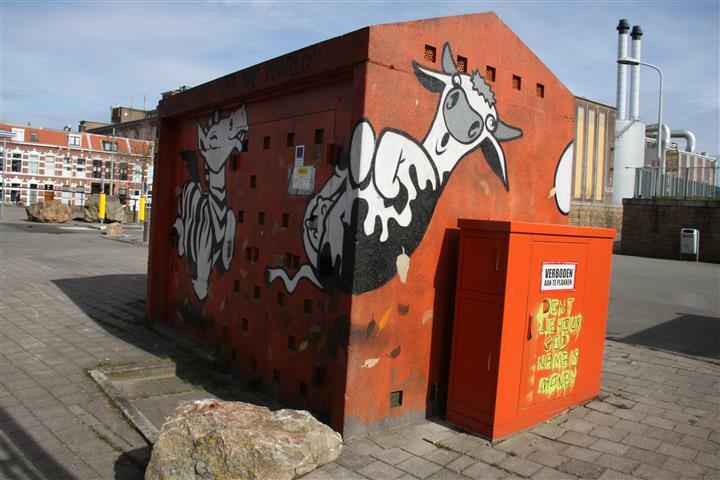 It’s been a while since I’ve done a post on some of the Electrical Substations that have been decorated around the Den Haag (The Hague) commissioned by the Geemente (City Council) in the last years. 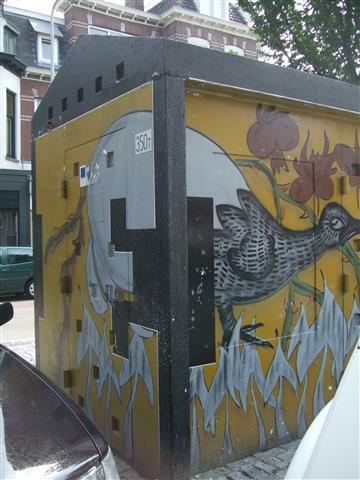 I think from memory that the “back” side of this on was only painted plain red or black, (at least there was no image on the back to take a photo of). There’s something ironic (or should I say subliminal?) 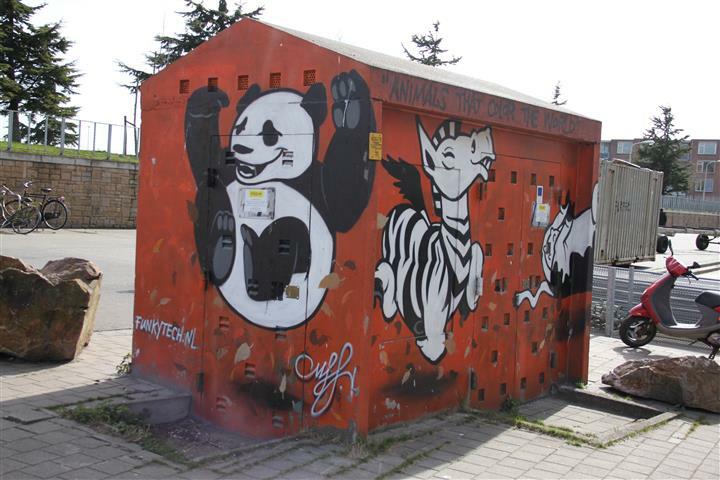 too about putting a “humming” image on an Eletrical Substation, don’t you think? Enjoy! Yep, have to confess that I was handed the title of this post… rather literally, on a box. 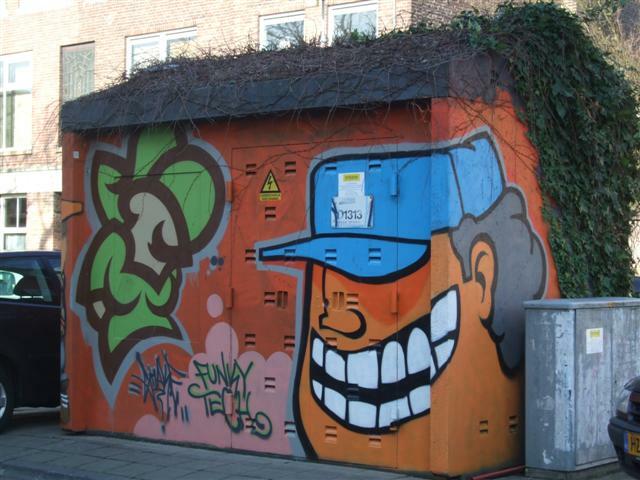 An electrical substation box to be precise and this one just made me laugh. 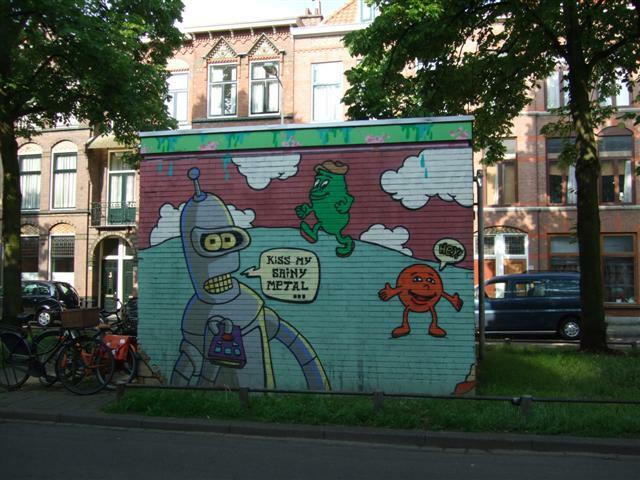 It’s an excellent combination of whimsy, rebellion, innuendo, colour and fun. 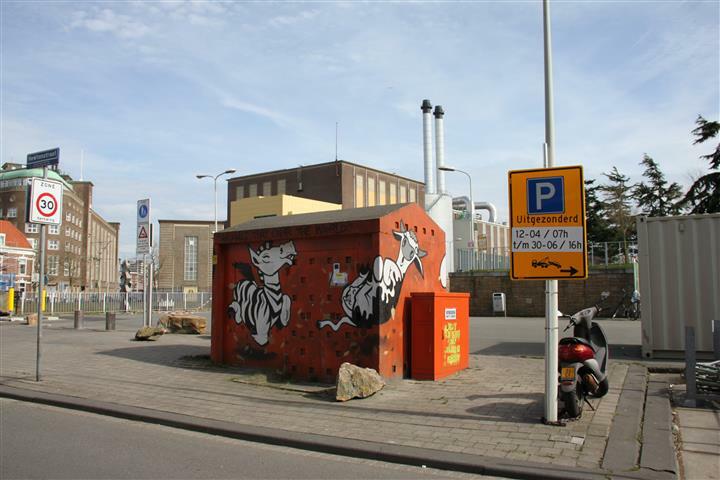 If you are new to the posts in this series, then these are Electrical substations around the Den Haag (The Hague) where the Geemente (City Council) have commissioned local artists to decorate them. 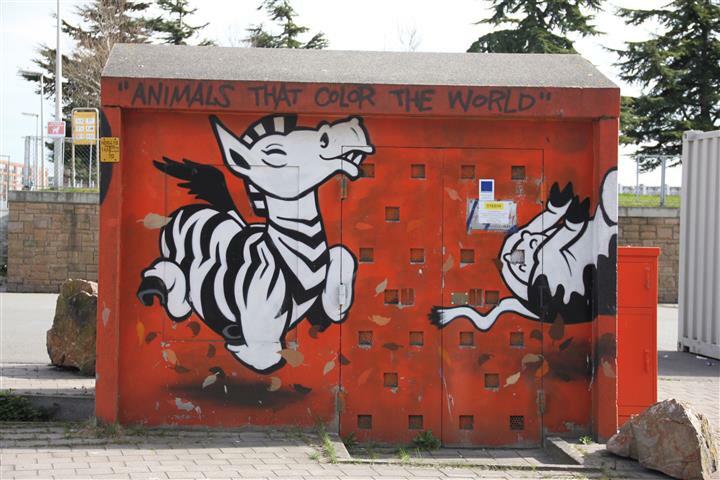 I love them because they brighten up the city streets and bring a smile to my face, so last summer made it a mission to go on long walks and take photos of as many of them as possible. The girl in the red dress reminds me of the character “Annie” … but was there a red dog in that movie anywhere? I struggle to remember one. Personally I’ve never seen a mole, but if one appeared out of the ground sporting a blue hat like this one, it would be hard to be angry wouldn’t it? That said, I also don’t have a garden, which probably goes a very long way to explain why I think these little creatures are rather charming. 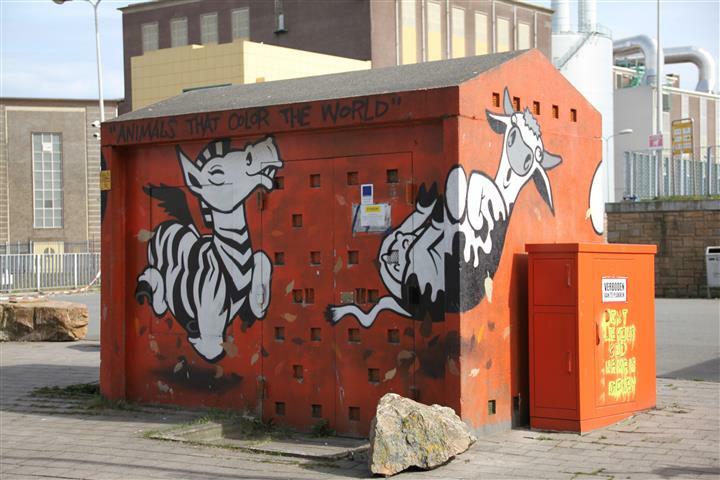 I took these photos last summer, but this is a substation that I don’t pass very frequently so I think from memory that it’s located on the Regentesseaan, close to the Loosduinseweg. 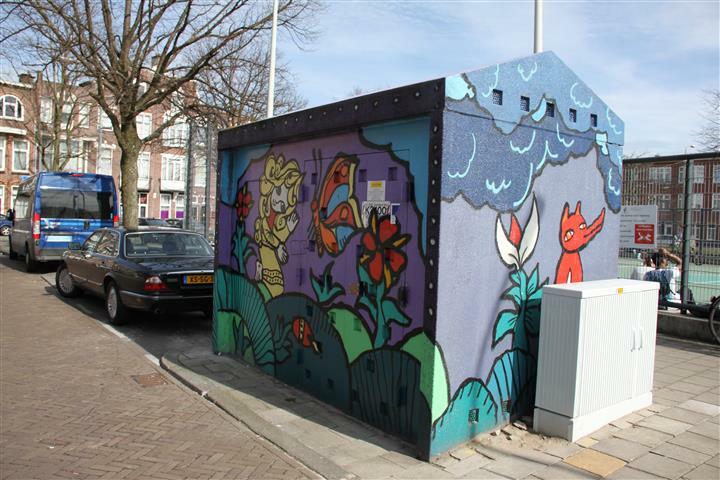 The Hague City Council (Gemeente Den Haag) commissioned a beautification programme for the city’s Electrical Substations. Last year I got busy and have been busy trying to photograph as many of them as I can. 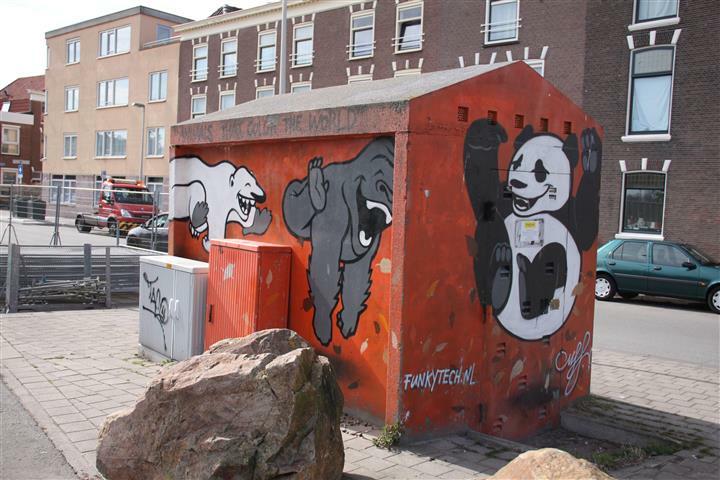 Since I’m still not mobile, this is a post from my archive files to show so some more of the street art on display in Den Haag. 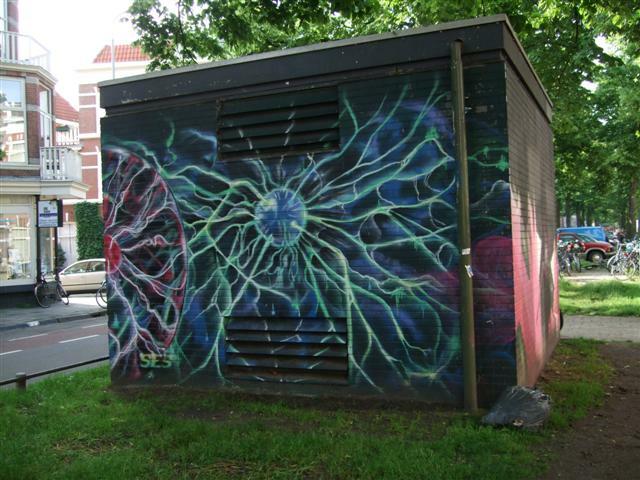 If you live locally enough, you can find this electrical sub-station on the Regentesselaan in The Hague. 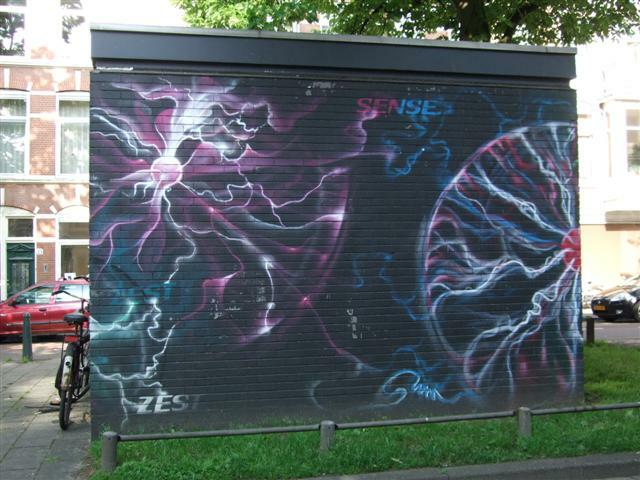 For me personally, it’s not a style I’d like to have say, as painting in my living room wall, but I am delighted to see the energetic colour and electric vibe of it in the street, especially on what was formerly a boring grey/green box in the middle of quite a busy road. 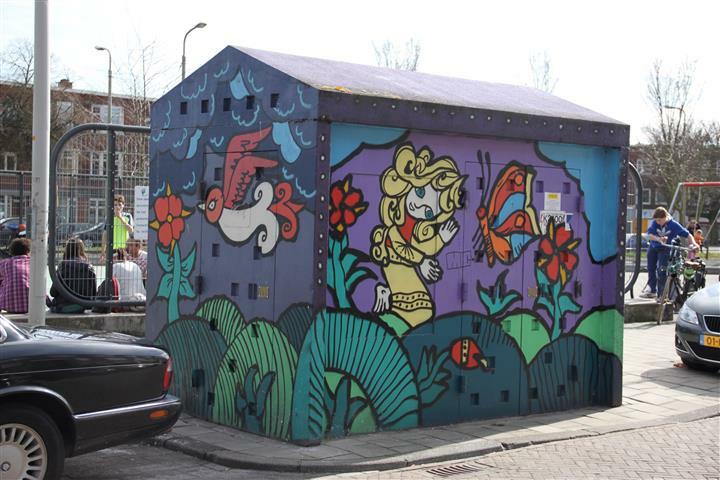 Yes, another addition to my painted Electrical Substation series. 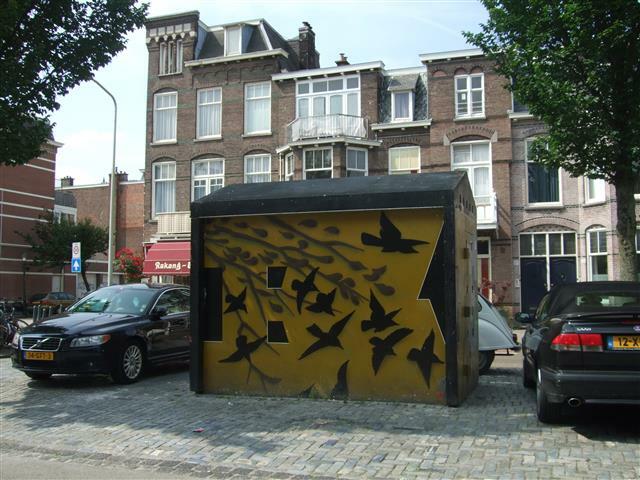 These city gray rectangular lumps have been transformed by artists employed by Gemeente Den Haag (The Hague City Council). 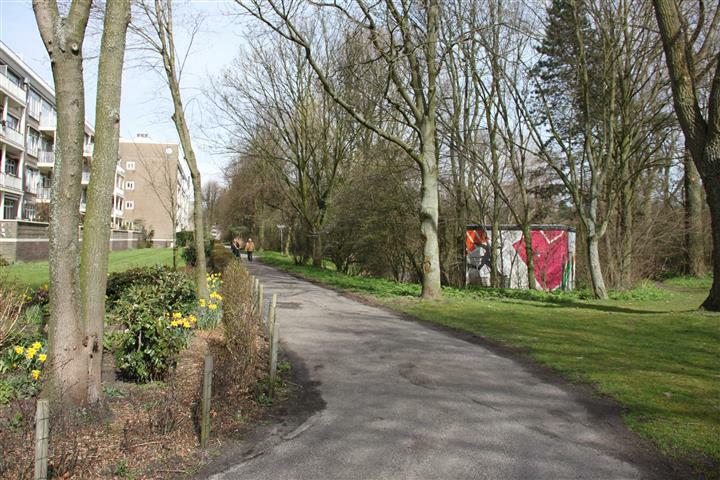 I’m delighted to keep finding new ones and to promote them a little further than the neighbourhoods they stand in. After all, if they brighten up my day, then maybe they will brighten up yours too. 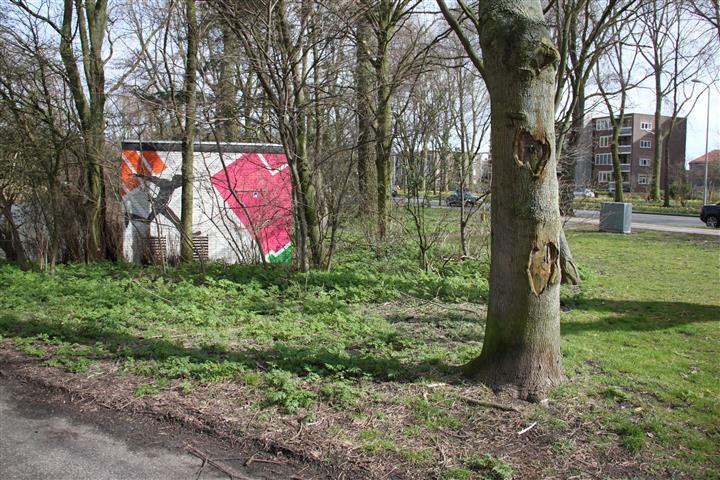 This one stands on the intersection of the Thomsonlaan and Valkenboskade (on the side closest to Goudenregenstraat). 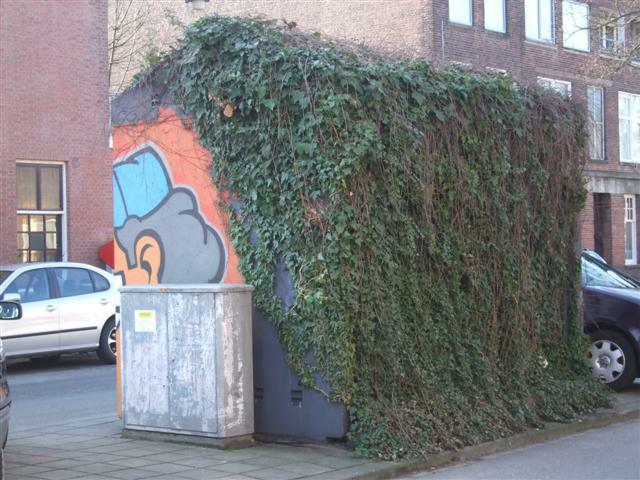 The city council never removes ivy or plants already growing on the side of these, so this substation has one of the larger sides covered and part of one of the small sides too. Just like the artists, I will have to work around that. My job was made harder by the fact that there is a parking area in the middle of the street and every time I’ve tried to photograph it, there have been cars parked up very close to the substation. I did my best. I’ve been busy trying to photograph as many of them as I can. 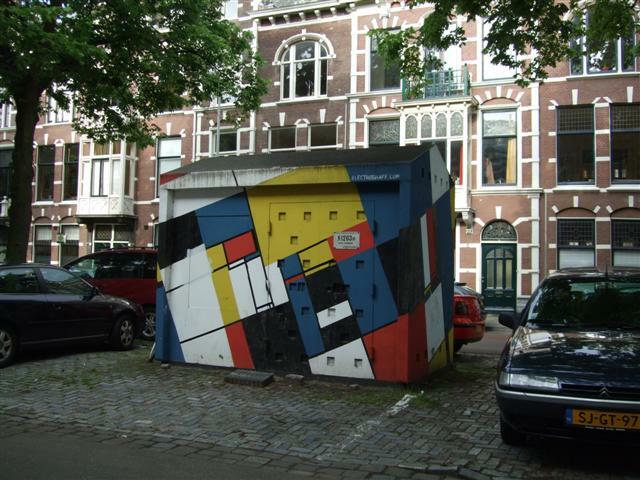 Dutch artist Pieter Cornelis “Piet” Mondriaan was born in Amersfoort in 1872 was the son of an art teacher. 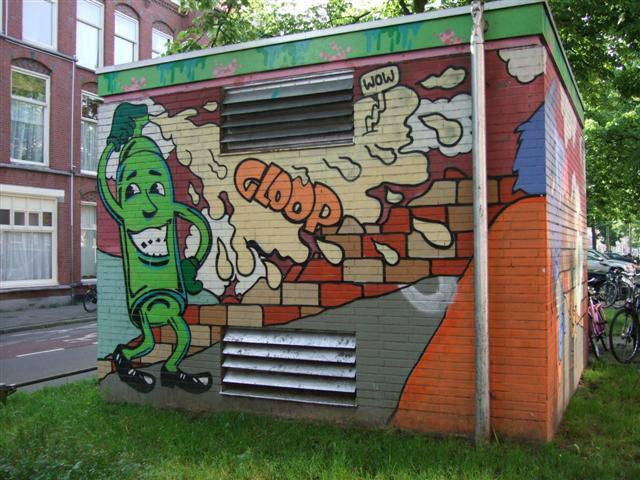 He qualified as a teacher and also studied fine art in Amsterdam. He was initially influenced by Naturalism and Impressionism but it was the Cubist movement that was to change the style of his painting for ever. 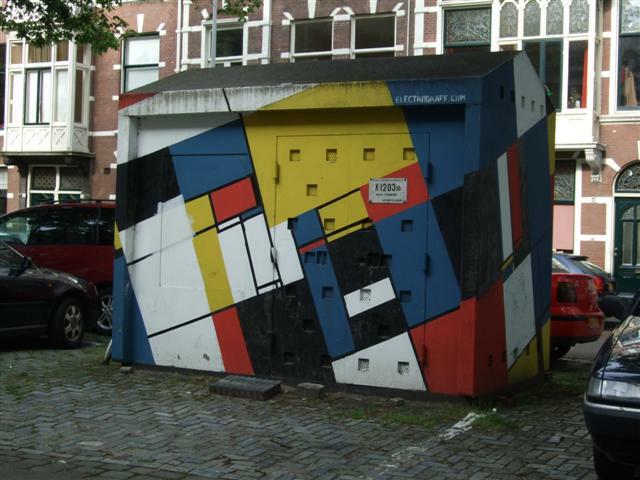 Mondriaan moved to Paris as a young man, dropped an “a” from his surname and became known as “Mondrian”. On a visit back to The (neutral) Netherlands in 1914, World War 1 broke out and he was unable to return to Paris until the war ended. 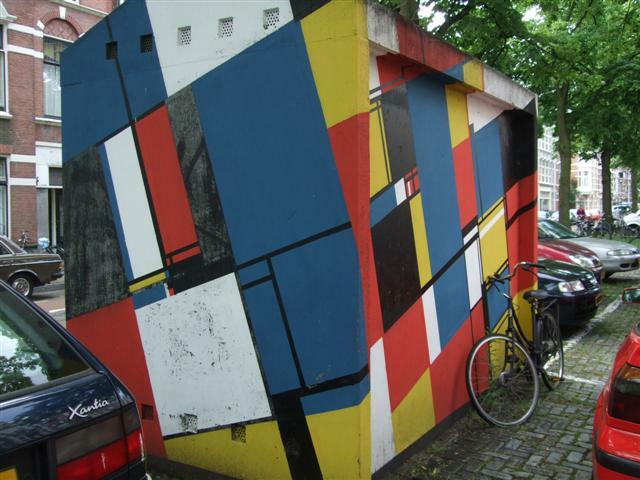 He returned to Paris after the war and evolved his definitive style of geometric black lines and coloured squares. Later after a short stint in London, he moved to New York (Manhattan) in 1940 to escape fascism and the outbreak of the second world war in Europe. He died in Manhattan in 1944. 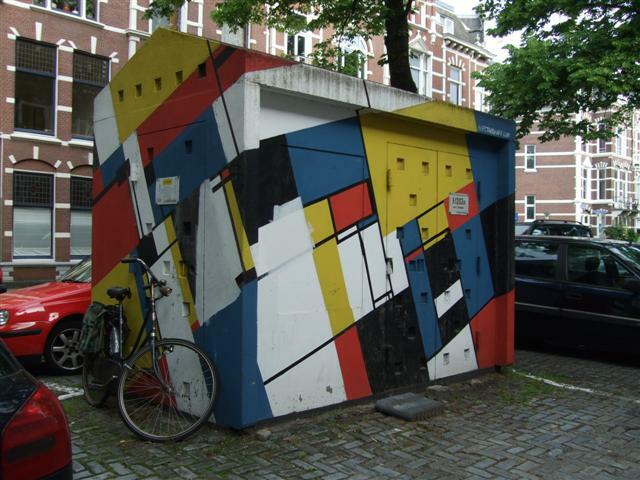 This electrical substation pays homage to Mondrian’s work and certainly brightens up a Dutch street in a manner that Mondrian would have been delighted to see.